Made in Japan and crafted from fine ceramic, this sake gift set comes with a sake jug and two complementing sake cups. 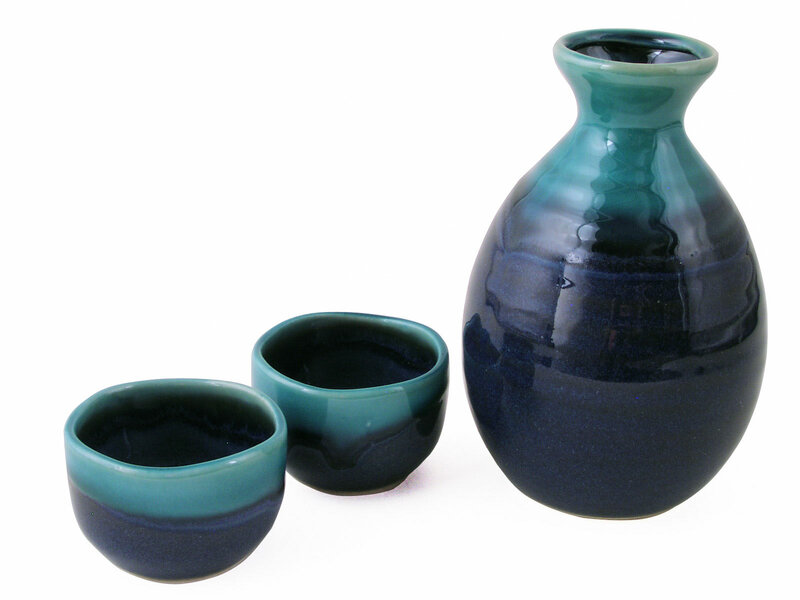 Featuring a calming two toned design, this sake gift set features a lovely turquoise top subtly blending into dark blue base. Bringing to mind the tranquility of a peaceful lake, this lovely sake set is a wonderful way to relax and enjoy a great cup of sake with a friend. Beautifully glazed to a smooth glossy finish, this sake gift set for two comes with a lovely curved sake bottle with indented sides designed for grip when serving. Each lovely sake cup also ridges adding unique visual texture. Packaged in a paper box, this sake gift set makes a gorgeous gift for sake lovers. Hand washing is recommended for this item.